Given the close proximity of the site to a historic landfill, a contaminated land planning condition was attached to the decision notice for the subject development. Demeter Environmental were commissioned to prepare the desk study report for the site and to determine what further works, if any, would be required. Initially the history of the site was determined using a combination of Ordnance Survey maps, aerial plates and street level imagery. The 1891 O.S. map indicate the majority of the site formed part of a ponds, which was in-filed between 1951 and 1967. Data provided by the Environment Agency indicated the in-filled pond was identified as a historic landfill that accepted commercial and household waste, hence it was regarded as a credible source of ground gases. Two additional ponds were identified within 250m of the site, which were discounted as credible sources of ground gases. Drift deposits of peat were recorded to be present in close proximity of the site, which has the potential to generate ground gases. On completion of the desk based assessment a site reconnaissance visit was undertaken, which revealed the site to be occupied by the poultry shed. Technical details of the cooling and ventilation system required for the maintenance of suitable living conditions comprised of active ventilation, gas monitoring and alarm systems, which would exceed the gas protection measures that would be likely required. 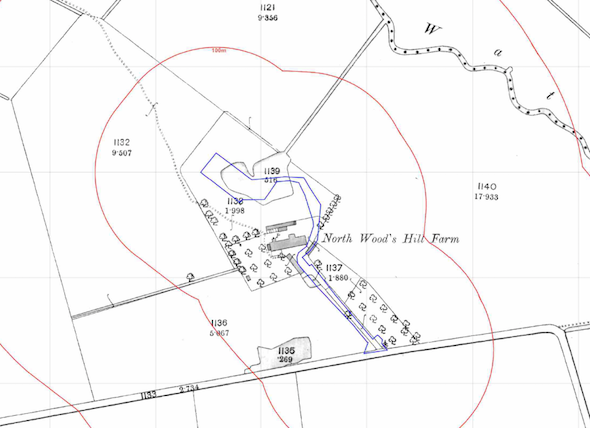 Based on this, it was determined that the poultry shed would be suitable for use and not further works were required. The desk study report was formally submitted with planning application 16/00538/DIS, the memo discharging the condition can be accessed here.